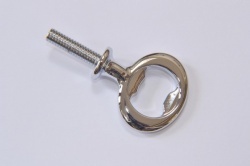 Made from solid brass with a super quality chrome or 24 carat gold plating these are really useful end caps as they can often make a project turnable between centres. Sold in packs of 4 caps, individually bagged for protection in transit. These are great for bottle stoppers cheese knife kits and many other projects that are handle based. Can also be used as feet!